SensitivityThe minimum detectable dose of this kit is typically less than 9.17pg/mL. This assay has high sensitivity and excellent specificity for detection of Angiotensin II (AngII). No significant cross-reactivity or interference between Angiotensin II (AngII) and analogues was observed. Matrices listed below were spiked with certain level of recombinant Angiotensin II (AngII) and the recovery rates were calculated by comparing the measured value to the expected amount of Angiotensin II (AngII) in samples. Intra-assay Precision (Precision within an assay): 3 samples with low, middle and high level Angiotensin II (AngII) were tested 20 times on one plate, respectively. Inter-assay Precision (Precision between assays): 3 samples with low, middle and high level Angiotensin II (AngII) were tested on 3 different plates, 8 replicates in each plate. The linearity of the kit was assayed by testing samples spiked with appropriate concentration of Angiotensin II (AngII) and their serial dilutions. The results were demonstrated by the percentage of calculated concentration to the expected. 2. Add 50µL standard or sample to each well. And then add 50µL prepared Detection Reagent A immediately. 7. Add 50µL Stop Solution. Read at 450 nm immediately. CEA005Ra ELISA Kit for Angiotensin II (AngII) Enzyme-linked immunosorbent assay for Antigen Detection. 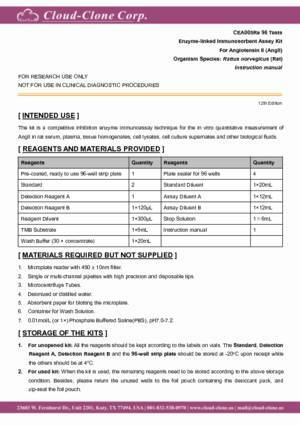 KSA005Ra11 ELISA Kit DIY Materials for Angiotensin II (AngII) Main materials for "Do It (ELISA Kit) Yourself".